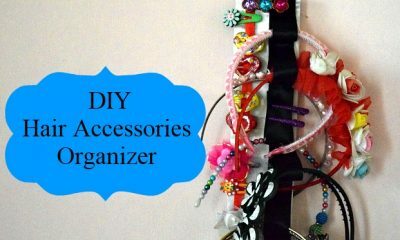 Its an easy & quick idea, lets catch the how-to!! One…Two…Three(this post)Four=coming soon Five…All Necklace Tutorials. 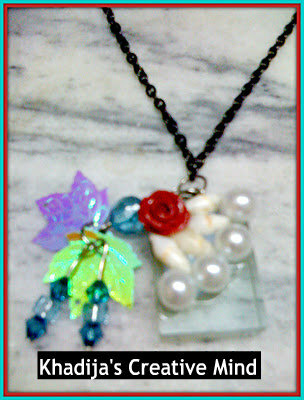 I am enjoying my creations,I hope you will also like these..! I love this pendant idea. I would love for you to add it to my Best of 2011 link party, as well as any other projects you are most proud of from this year. Visit http://www.petalstopicots.com. Awesome creations midst all your studies! Thank you friends for admiring my pendant :) you all are so sweet !! 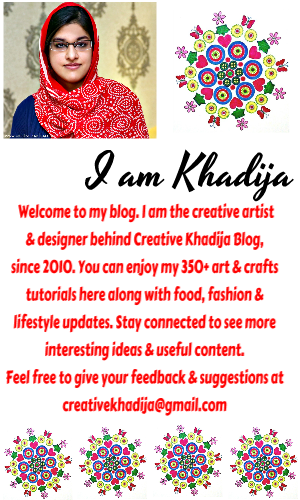 HOLA KHADIJA GUAPA !!!!! QUE BONITA COMBINACION !!!! !MUY BIEN ARMONIZADOS TODOS LOS ELEMENTOS. BONITO DE VERAS. RECIBE MUCHOS, MUCHOS BESOS DESDE CADIZ, ESPAÑA. and good luck for your exams !! That is so cute! I really like the effect of the 3-D items on top of the glass tile. Thanks for another fun tutorial, K! I love you necklaces! Thanks for linking to Thrifty Thursday. 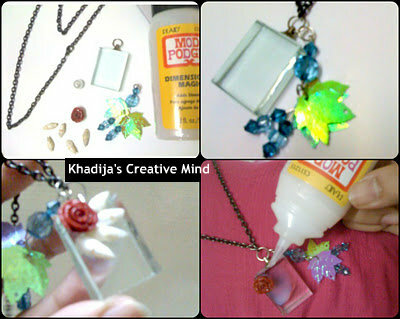 I had never thought of using the glass tile as the base and embedding things on top. Cool. Thank you & I love to share! Tiny things on glass tile is just fun! Just wanted to wish you a merry Christmas from Bacon Time. Thanks for sharing your pretty pendant. I have a ton of books on making your own jewelry. I really hope I can find the time to start. I’m interested in doing intricate beaded work and some polymer clay pieces…I have all the tools and supplies – all I need is the time. Im stopping by from Favorite Things Thursday. Beautiful. 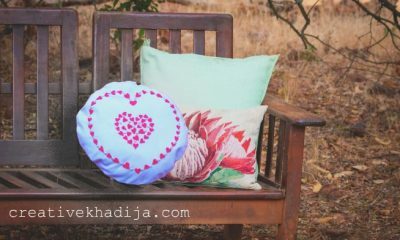 I love blog hopping and discovering so many creative people! Happy Holidays. i will share the tutorial of #4 soon ! I think it’s neat that you make your own jewelry. It looks like a fun time! thank you dear friend :) so nice of you! Hi, Khadija. 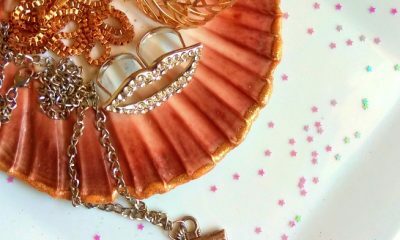 You have such cute ideas for jewelry. 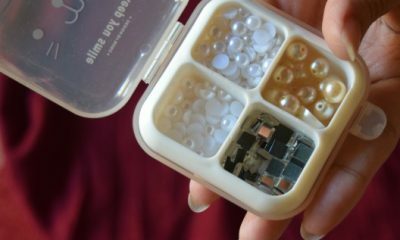 I really liked your jewelry frame for organizing earrings, etc. Very useful idea! Lovely! Thanks for linking to Things I’ve Done Thursday! Merry Christmas! Thank you for sharing this beautiful post at Potpourri Friday! Have a wonderful Holiday Season! Thanks for admiring my idea :) my goodness! Beautiful necklace! Hope your exams went well! I just might be inspired to try making some of my own jewellery next year! Very pretty! I bet you get lots of compliments on it! Thanks, exams are over now & I am enjoying holidays! 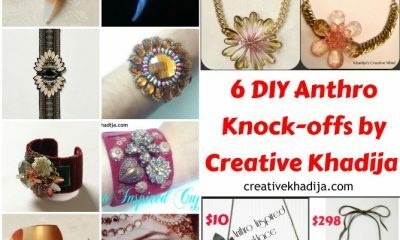 try jewelry making 7 i hoe you will have fun! Thanks dear for admiring this :) i hoe i will have many! Very pretty pendant! So happy to have you link up to the Tuesday To Do Party at The Blackberry Vine! 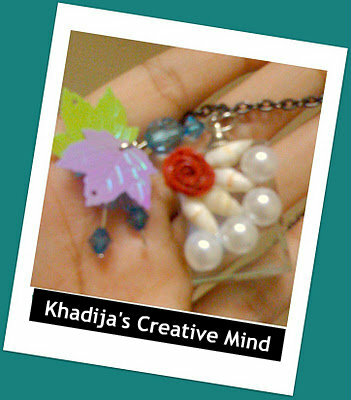 These turned out so pretty, Khadija! thanks for sharing… We are featuring it in the blog today! a happy new year to you and your family! Thank you so much for admiring this :) so sweet!